2001: Attack of the Living Slush Pile: Vanity Presses Prove Anyone Can Write a Book. Usually a Bad One. The vanity press is an ancient idea, born just one day after the first rejection slip. Under the old model, vanity presses would print a few thousand copies for an exorbitant price, even if the elite of the New York publishing industry considered the book unmarketable. Print-on-demand houses solicit clients online, then use the latest technology to crank out only enough books to meet existing orders—a run so small the book would sink in the mass market. Sounds good, but the problem is that a lot of these books should sink, because they’re poorly written or because their audience is limited to the far-right fringe. Print-on-demand writers rake in whatever they can through selling their books—often by hand and on their lonesome. Not only doesn’t Xlibris depend on author sales, the company probably wouldn’t survive if it did. As of November, its bestseller had moved only “somewhere between 1000 and 2000 units,” says CEO John Feldcamp. Half of all sales go to the “pocket markets” surrounding the author—friends, family, a few bulk sales if the author can arrange a signing or a reading, the occasional classroom placement. While there are a number of very good Xlibris books available, especially those that were once part of a standard royalty publisher’s list, an examination of randomly chosen Xlibris fiction titles reveals a catalog full of clichéd plots and terrible-to-middling writing, not to mention downright bizarre notions of the world. One title, David L. Buhlman’s Final Warning, billed as “an adventure story about a bleak near future that may be more likely than most would care to admit,” imagines life after a takeover by the pagan-feminist New World Way. “In order to control population growth, people are put to death at age sixty, abortions are forced, and the sickness of pedophilia is legalized and encouraged. But with boys only, not girls. Girls are protected because they are identified with the goddess Gaia, the religious myth that undergirds the New World Way. The mainline Christian denominations are forced to insinuate the Gaian rituals into all religious ceremonies, and religious leaders who would not cooperate are imprisoned.” The novel also features cloned ratmen who probably aren’t Christian either. 1984 it ain’t, but Feldcamp insists such a title has a market. “Do we have an obligation to say that that author can’t reach that market?” he says. “No, we’re not a publisher. Traditional publishing works great for publishers, but not for authors. . . . It excludes 95 percent of the books that are written.” Feldcamp claims sales will increase as the publishing industry shifts, but the bottom 95 percent of all books written will not be driving any changes in publishing if nobody is buying them. And publishing hasn’t changed enough yet. Xlibris, in January, hiked prices on its services, laid off employees, canceled the long-running e-mail newsletter Inkspot, and delayed plans for expansion into the European market. iUniverse has its share of winners (or is that wieners?) as well. . . . And Then You Die, by John Robert Jorrisen, begins with a homeless woman finding six fetuses in a rubbish bin outside an abortion clinic cleverly nicknamed “The Butcher Shop,” and as the book tells it, one of these aborted fetuses “was moving!” The bag lady quickly adopts the embryo as her own and walks off with it in her shopping cart. What market does this book have? Pro-lifers who insist that abortion is murder, but might consider that sometimes it is merely assault? Would-be adoptive parents looking for a cheap alternative? The nonfiction is often little better. iUniverse presents America Under Siege by Robert W. Pelton, a book that claims “untold numbers of hostile foreign troops as well as thousands of Russian tanks, trucks and other military vehicles are being brought into our country,” a notion made famous by the right-wing militia movement and only true when those “untold numbers” are very, very low. Xlibris offers Charles Munn’s self-help book Becoming the Thinker, which promises that you “will be flooded with the serene knowledge of your inner power as you project your desires and mold the future.” Wow! These books are sold alongside more reasonable titles like iUniverse’s Campaign and Party Finance in North America and Western Europe, an academic book that may have a very small audience, but which does deserve to be in print. Indeed, it probably deserves better than the iUniverse treatment. The publisher made a splash following an investment by Barnes & Noble, America’s leading book chain, two years ago. Posters and brochures at B&N promised that you too could become a published author. B&N even carried some iUniverse titles, albeit in the Writing and Publishing section of their bookstores, where wannabe writers hang out. There were other problems as well, including the accidental elimination of 400 iUniverse titles from its online bookstore and database. There was even talk of a class-action suit against the company last year. In October, iUniverse received another influx of cash, this one from Warburg Pincus Inc., an investment bank. iUniverse immediately laid off many of its columnists and community leaders, and de-emphasized its vanity operation to concentrate on business-to-business projects. iUniverse is using its technology to get into e-books, having made deals with IDG Books Worldwide (of the “Fill in the Blank for Dummies” series) and the distributor Publishers Group West. The happy faces of iUniverse authors are long gone from the Web site’s lead page, and the iUniverse bookstore is now buried under a couple of layers of links. Prodded by groups like the Authors Guild and the Harlem Writers Guild, iUniverse is bringing some important books back into print. Mike Levine, the former DEA agent turned government critic, brought his New York Times bestseller, Deep Cover, back thanks to iUniverse and the Authors Guild’s program, BackinPrint.com. Unlike the vanity customers, Levine didn’t have to pay a cent to get iUniverse to reissue his book. BackinPrint.com has also negotiated with the Shakespeare & Co. bookstores to carry these particular iUniverse titles. Bringing works back is inherently less risky than accepting work from people whose only skill may be filling out a check for $99, and these works have built-in audiences, whereas most wannabes have only their elderly relatives and anti-ratmen activists. Random House Ventures, LLC, the investment subsidiary of Random House, Inc., has invested heavily in Xlibris, but not for the rights to the vanity firm’s massive list of titles. “Random House is not interested in much in the short term,” Feldcamp says, but the investors do “think hard about the future.” And in the future, it is unlikely that the vanity press will be any more profitable than it is right now. Print-on-demand and e-books will change the publishing industry, but the importance of an editorial filtering system to spare customers from bad writing is clear. Book editors and their fiefdoms, institutional paralysis and all, will survive even a takeover by pagan-feminists and homeless fetuses driving Russian tanks ahead of an army of ratmen. They’ve already faced worse, in the mountains of unreadable slush filling their offices. 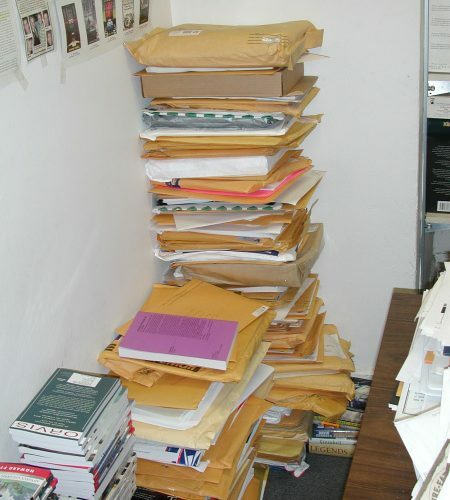 Posted in StrangenessTagged Authors Guild, Barnes & Noble, iUniverse, National Writers Union, Publishers Group West, Vanity press, Slush pilecommentLeave a Comment on 2001: Attack of the Living Slush Pile: Vanity Presses Prove Anyone Can Write a Book. Usually a Bad One.